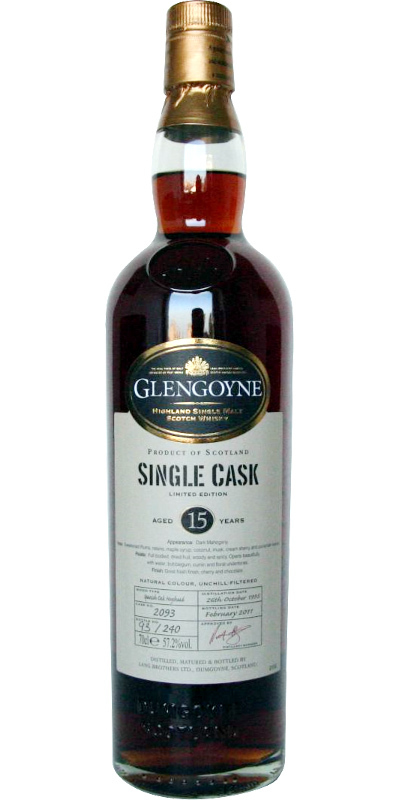 Lovely, again these heavily sherried Glengoyne single cask expressions tend to remind me of Kavalan Solish sherry bottlings. Slight notes of sulphur and rubber, except for that I find this nose excellent. Tons of stewed red fruits, strawberries, blackcurrant, raisins, prunes, some orange zest, dark chocolate, demerara. Also lighter notes of peach, vanilla and some intriguing spices emerge after a while. Very elegant. Sweet and sour, dark fruits, chocolate, toffee vs lemon juice and other citrus fruits. So rich and thick that you could almost cut it. Spicier notes are there too, but they come as a nice emphasis of the flavours rather than as a distraction. Quite long, slightly drying, but still very rich on fruits and caramel.